A week of Khamoro music concerts has left us with sounds of accordions, strings and brass ringing in our ears. We walk the streets of Prague, tapping our fingers to beautiful melodies, singing snippets of songs we’ve picked up along the way. We’ve experienced flamenco, Gypsy jazz, Romani musical traditions from Slovakia, Russia, Serbia, and danced to the energetic rhythms of the famed Kocani Orkestar from Macedonia. We’ve also been inspired by the fusion sounds of Urs Karpatz (Carpathian Bears) from France who draw their repertoires from similar sources as the University of Pittsburgh’s Carpathian Music Ensemble. 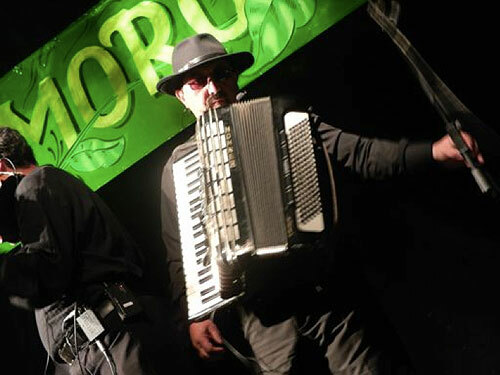 Our musical heroes play the accordion and wear shades. Urs Karpatz (France) performed at the Roxy on May 31, 2012. The group features a violin, cimbalom, double bass, accordion, and doumbek. Their name invokes the “Ursari,” a Roma group who were historically bear handlers (for entertainment) in the Carpathian region and the Balkans. The University of Pittsburgh study abroad students during the first concert of the 14th Khamoro World Roma Festival evening concerts, dancing to the sounds of Mec Yek (Belgium) at the Retro Music Hall in Prague, Czech Republic. 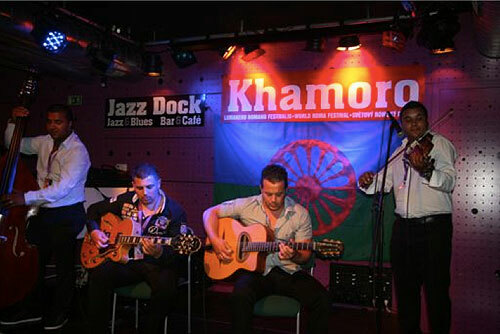 The second and third evenings’ concerts featured Gypsy Jazz (also known as Sinti Jazz, Gypsy Swing, etc. ), a genre developed by the Sinti guitarist Django Reinhardt (1910-1953) and French violinist Stephane Grappelli (1908-1997). Django is known for his virtuosity on the guitar and his resilience in developing new playing techniques after suffering from a fire that severely injured his left hand. Many musicians have emulated Django’s style, and the music of Reinhardt and Grappelli is considered standard repertoire for Gypsy jazz. The concerts were in a small venue called “Jazz Dock,” a bar with a dock that extends into the Vltava River that runs through Prague. 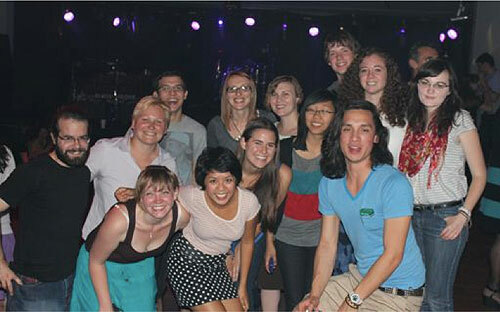 There were a small group of tables toward the front of the stage where some of our students sat close to the musicians. Others filmed from the back of the club, interviewing audience members and talking to musicians during their breaks. The two Gypsy Jazz concerts were very different in their feel. On May 29, 2012 we heard a group featuring Fapy Lafertin (Belgium-Netherlands) on guitar playing with non-Roma violinist Tim Kliphuis, accompanied by a double bass and rhythm guitar. In Gypsy Jazz, the lead guitar plays the melody and improvisational elements for much of the song, sharing solos with the violin. The rhythm guitar plays strong strums, offering a harmonic underpinning, while the double bass lays the harmonic groundwork for the song. The stress lies on virtuosity and rhythmic energy. The four musicians had never played together before, and so the concert took on an improvisatory, fun feel as the musicians figured out each other’s styles and used eye contact and physical gestures to maneuver through Gypsy jazz standards including many of Django’s well-known songs like “Minor Swing.” Violinist Tim Kliphuis spoke to the crowd, and joked as he forgot the names of songs, and one could feel the energy and nervous excitement as the musicians launched into yet another song they had never practiced together. We became even more conscious of this energy the next day when the it contrasted with the more rehearsed presentation of the famed Sonnekai (Netherlands-Germany) comprising two of the most well-known families in Gypsy Jazz history – the Reinhardts and the Rosenbergs. Descendants of Django Reinhardt and the musicians of the famous Rosenberg Trio from Germany who gained notoriety in the late 1980s, these cousins have been playing together since their pre-teen years and presented a very polished performance, with all musicians ending cadences together and moving seamlessly between superbly crafted improvisational solos. They did not engage with the crowd by telling stories or explaining their music, and thus created a rather more formal concert atmosphere. Sonnekai, featuring Fremdo Rosenberg (bass), Faifie Reinhardt (guitar), Daniel Rosenberg (rhythm guitar), Wattie Rosenberg (violin) performed at the Jazz Dock on May 30, 2012, the third night of the Khamoro World Roma Festival in Prague. These two concerts featuring two groups with the same instrumental set-up revealed two examples of how Django Reinhardt’s music has influenced the development of Gypsy Jazz in the 20th century. As evidenced by Fapy Lafertin’s band, Django’s music offers a set of jazz standards that all musicians playing in this genre know and can get together to play. Sonnekai’s polished sounds index a history of Gypsy Jazz as an acceptable form of music in a variety of venues now ranging from clubs to festivals and formal concerts. Django, who grew up in a Roma community on the outskirts of Paris, wore a suit and tie when performing with the Quintet du Hot Club de France. He developed and popularized an elite musical form for Roma musicians to emulate. Looking back at the diversity in the concerts of the Khamoro Festival, we might say that the weeklong event was musically divided into two parts. The first three days featured popular music and Gypsy Jazz and drew a predominantly Roma audience. On Thursday, the festival presented itself on a wide scale to the non-Roma public with a parade of artists through Prague’s Old Town. All Roma performers scheduled to perform in the Thursday, Friday, and Saturday concerts of traditional Roma music took part in the parade playing their instruments and periodically stopping to entice the onlookers with their colorful costumes and dances. While it has not been possible for us to upload our fieldwork videos to YouTube due to the slow Internet connections, some photos offer a slight idea of the parade’s beauty and effectiveness in reinforcing the presence of Roma music in Prague. It is very difficult to convey the impact of numerous Roma musical traditions competing for musical space, blurring together, creating a cacophonous harmony and a deafening sound as the music bounced off the buildings in the narrow cobblestone streets of the Old Town. On the one hand, such a parade offers agency to the musicians in that onlookers acknowledge the musicians and take notice of the “Khamoro” event and the performers’ talents. On the other hand, such a parade reinforces historical and cultural stereotypes in the minds of non-Roma that all Roma are dancers and musicians. Their colorful costumes create a sense of carnival and reinforce a sense of the Other, stressing cultural, linguistic, and ethnic differences from the majority. Nevertheless, the parade welcomed participation from musicians and onlookers and all who stood along the route were invited to walk and dance alongside the Khamoro festival performers. 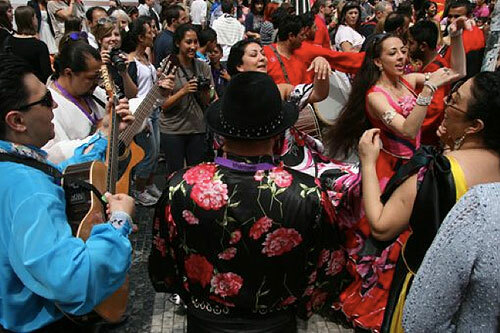 The parade helped draw a large number of non-Roma to the concerts of traditional Roma music in the latter half of the festival. It is significant to note that the Gypsy Jazz musicians from the first half of the festival did not take part in the parade and did not wear any costumes during their performance. The audiences at the Gypsy Jazz concerts were predominantly middle-class, older Roma, while the concerts of traditional music drew larger audiences of non-Roma to whom much “Gypsy” music is marketed. 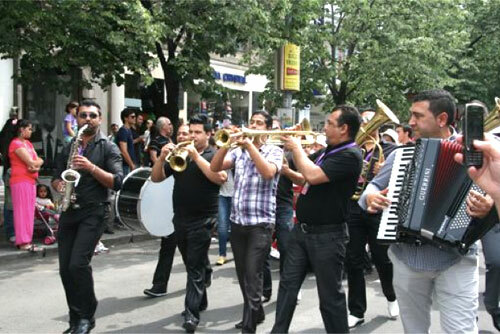 Kocani Orkestar (Macedonia) dominated the aural space of the Khamoro parade of artists with their music’s odd meters and tight brass harmonies on May 31, 2012. The Nikolay Verbitsky Group (Russia) stopped along the Khamoro parade route to impress the onlookers with colorful costumes, music and dance inspired by the Ruska Roma traditions popularized by Moscow’s Teater Romen (est. 1931). The University of Pittsburgh students, initially surprised by the lack of parade barriers and police prevalent during such events in the United States (during fieldwork, we learn as much about ourselves as we do about others), were quickly pulled into the excitement and climbed onto street lamp poles to get better footage of the parade. During the parade and at the last three concerts of the Khamoro festival, we immersed ourselves in the emotional expressiveness of flamenco singer Carmen Fernandez (Spain) and flamenco dancers Irene Alvarez and Federico Ordonez. Stevan Familic from Serbia provided excellent technical skill on the tamburica, accompanied by a group of tamburica players and double bass who provided the harmonic support for his improvisational technique. Cindzi Renta, a local band from the southern Bohemian town of Cesky Krumlov offered an opportunity to hear traditional Romani music local to the Czech Republic. And Romathan “(Place for Roma”) the well-known Roma theater from Kosice, Slovakia prepared us for our experiences in eastern Slovakia when we meet with Romathan again toward the end of our study abroad program. The Khamoro festival is funded by numerous government and development agencies such as the Open Society Foundation, the U.S. Embassy, the Czech Ministry of Culture, Goethe Institute, European Commission, Czech Republic, Decade of Roma Inclusion 2005-2015 and numerous other institutions. Despite the Khamoro festival’s significant role in Roma cultural development (the festival features roundtables and lectures on a variety of human rights, educational, and cultural topics) funding for the festival has been steadily declining and promises to be more difficult to procure in the future. The students clearly have been affected by their experiences at Khamoro and have been passionately debating issues relating to funding and the festival’s structure. As we work to strengthen the relationship between the University of Pittsburgh, Charles University in Prague, and the Khamoro World Roma Festival, we can be sure of one thing: Our students have immersed themselves in a complex dialogue that relates music, education, and human rights in terms of hands-on initiatives that work to secure equal representation for Europe’s most discriminated minority. Now, that’s the way to earn 3 credits.